According to sources, the slain soldiers had just left their military base in Gedo region before they were accosted by the terrorist group in surprise. 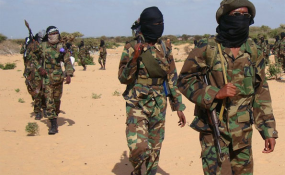 KDF soldiers that had withdrawn from the Busar military base in Gedo region of Somalia have been attacked by Alshabaab as they made their way to the Kenya border, El Wak. At least 5 soldiers reported dead. KDF has in the last two weeks withdrawn from two major military bases.